As an ideal adjunct to chiropractic care, we use acupuncture when we see health problems that appear to be caused by disruption to energy pathways in your body called meridians. Acupuncture focuses on the integrity of bodily systems. 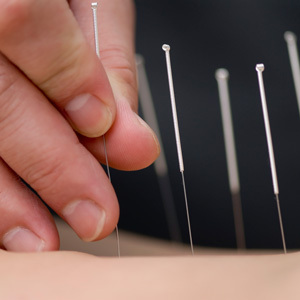 When we first insert these ultra-fine, sterile needles at special energy points on your body, most people report a small prick, like a mosquito bite and you may experience temporary soreness. When there is discomfort, it is usually created by vivid imaginations, not our needles! No one knows for sure. We just know it does. Perhaps the best way to think about acupuncture is to imagine rivers of energy throughout your body, organized by meridians. These meridians can experience a “logjam” and energy flow is restricted. The needles help loosen the logjam and allow energy or chi to circulate properly. The result is that any imbalances you may have can be corrected. Yes; your practitioner will utilize single-use disposable (and sterilized) needles minimizing any risk of infection. As acupuncture doesn’t involve surgery or medications, it’s considered one of the safer alternative healing modalities. Your treatment may take 30-60 minutes depending on what you’re seeing us for. What kind of sensation can I expect? Most people experience a variety of post-session feelings, which range from exhibiting energy to having a deep sense of relaxation and well-being. Discover the remarkable effects of acupuncture. Contact us today to book an appointment!